A night-time aerial view of oppression. Thanks to modern technology, we can see the effects of rigid ideologies from the stars. City lights at night are a fairly reliable indicator of where people live. But this isn’t always the case, and the Korean Peninsula shows why. As of July 2012, South Korea’s population was estimated at roughly 49 million people, and North Korea’s population was estimated at about half that number. 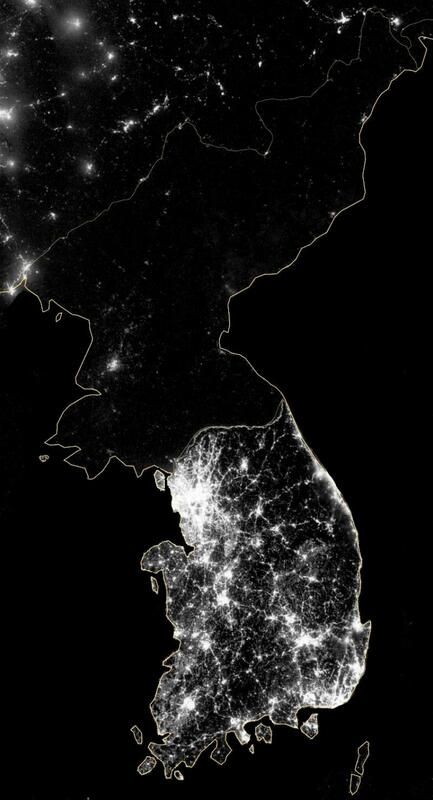 But where South Korea is gleaming with city lights, North Korea has hardly any lights at all—just a faint glimmer around Pyongyang. On September 24, 2012, the Visible Infrared Imaging Radiometer Suite (VIIRS) on the Suomi NPP satellite captured nighttime view of the Korean Peninsula (picture above). This imagery is from the VIIRS “day-night band,” which detects light in a range of wavelengths from green to near-infrared and uses filtering techniques to observe signals such as city lights, gas flares, auroras, wildfires, and reflected moonlight.